A 15 mm lens is a special-application tool: it is too wide for most applications and generally too large, heavy and expensive in order to earn a permanent place in a photographer’s bag. However, when faced with that incredibly wide landscape, whole-sky phenomena, tight interior or a scene needing extreme perspective, no other lens will do. 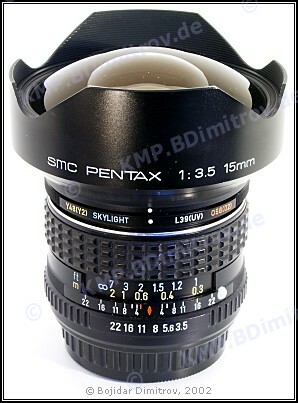 Pentax’s 15/3.5 lens fits very well into the above generalization. People who own it say that they do not use it often enough, but they absolutely love it and have no plans of parting with it. Amongst the reasons for this affection seem to be the lens’ extreme perspective as well as its absolutely superb optical and mechanical qualities. Apparently Pentax too thinks very highly of this lens because its successor, the A 15/3.5, retains the optical formula, mass and dimensions. It only fixes the limitations of the K-series lens by adding support for matrix metering, shutter-priority and program operation. A few insignificant criticisms can be made towards this lens: the built-in hood is too small to offer effective flare- and scratch-protection, the slip-on lens cap falls off far too easily, and the size and weight of the front element lead to a nose-heavy lens-camera combination. Another complaint (inherent to all non-shiftable ultra-wide lenses) is the strong line convergence. While this cannot be corrected by the lens, the photographer can be alerted to it by using a grid screen. The 15/3.5 is out of production, and because of its price and special-application nature, it is somewhat rare. However, a thorough search usually reveals a few units available for sale. Wide open the lens is a bit soft and with visible light fall-off (which is, by the way, worse in the viewfinder than on the film). When stopped down, the light fall-off disappears and resolution improves very fast. Distortion is extremely low. The lens colors are very nice and realistic and contrast is excellent. Any discussion of bokeh is not applicable as almost everything is in focus, regardless of the aperture setting. In general, flare resistance is impressive for a lens this wide, but when a bright light source is just outside of the frame edge, a number of brightly-colored hexagons can be seen in the image.